The first thing I thought when I first started reading about Paleo food was that it was going to be bland. Everything processed had flavor, artificial flavor, but still flavor. And I worried without cheese, I’d miss creamy Alfredo sauces, cheese burgers, and fondue. So when it comes to making even the simplest dish, I’ve made it my mission to make sure it’s flavorful. Make it something that even someone who is not eating Paleo, want to eat the meal I’ve made. For this burger, I added a few extra spices and a bit of a crunch. When you can’t have bread, you’ve got to take an extra step to make a hamburger more than a hamburger. Heat a medium sized skillet on medium-high heat. In a large bowl, mix ground beef, egg, almond flour, and spices until combined. Create 1/2 inch thick beef patties and cook through, about 7 minutes a side, or until each side is browned and cooked through. Slice tomato. Carefully unwrap layers of lettuce so that each piece is unbroken, you will use these as a your wrap. 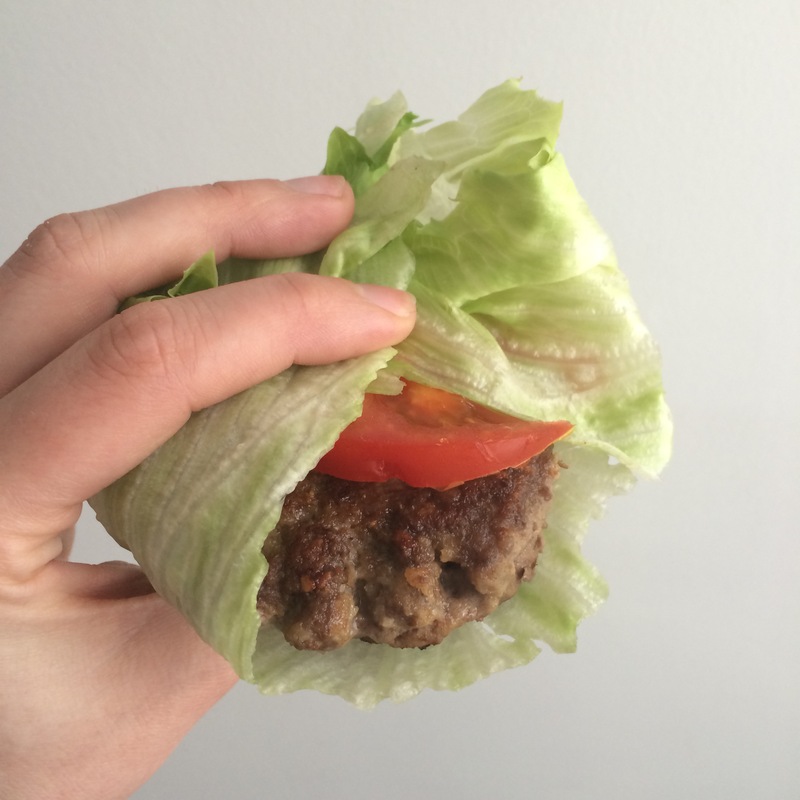 Place cooked hamburger in lettuce, top with tomato, and carefully wrap lettuce around burger. Enjoy.